Figure 1. A schematic of a pulsar. Note the misalignment of the magnetic and rotation axes. Pulsars are some of the universe’s best timekeepers. Formed during the supernova explosions of massive stars, pulsars are rapidly rotating neutron stars that possess strong magnetic fields (~1012 Gauss). For reference, that magnetic field could wipe your credit card from a distance half-way to the moon! A majority of pulsars observed from Earth appear as regularly spaced pulses of radio emission, with periods between 0.01 and 1 second. These pulses are not due to an intrinsic turning on and off of the source, but rather to the alignment of the system and Earth. 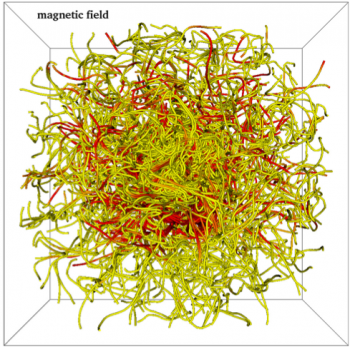 As energetic charged particles spiral along the strong magnetic field lines they emit a beam of radio synchrotron emission along the magnetic axis of the pulsar (see this astrobite for a review of synchrotron emission). 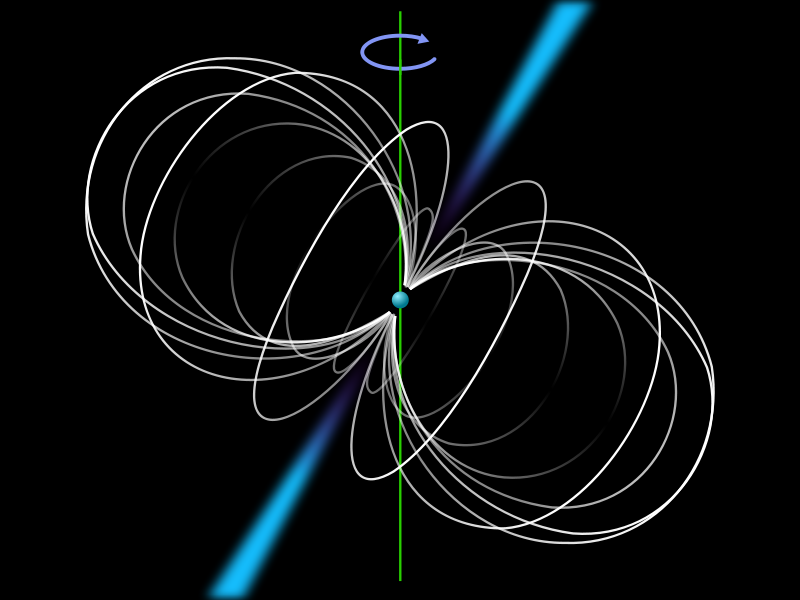 However, just like on earth, this magnetic axis need not be aligned with the pulsar’s rotation axis (see schematic in Figure 1). The result of this misalignment is a rotating beam of radiation. 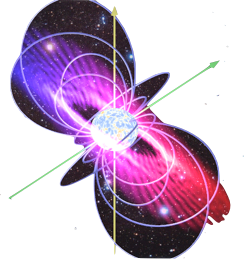 In a situation very similar to that of a lighthouse, we will see this radiation only once per rotation period of the pulsar as it intersects the line of site to Earth. The period of all pulsars gradually slows as the rotational energy of the neutron star goes into the radiation that we see. However, this effect can be measured and accounted for. By combining observations of multiple pulsars it is possible to create a timing system so precise it can actually be used to find inconsistencies in the atomic-clock system here on Earth. However, don’t be fooled. This does not mean that individual pulsars are devoid of “hiccups” in their pulse timing. Hundreds of pulsars have been observed to undergo phenomena known as glitches. A glitch is a very sudden decrease in the rotation period of the pulsar. Although not all glitches are the same (for instance, 20 – 30% are accompanied by pulses of X-ray emission) it is notable that they all show a change in the same direction – towards more rapid rotation. Until now, that is. Today’s paper, published in Nature, presents the first ever observation of a sudden decrease in a pulsar’s rate of rotation. As the authors dub it: an anti-glitch. This result is surprising not only because none of the (literally) hundreds of glitches observed to date have shown a sudden slowing of a pulsar’s spin-rate, but also because it is not an obvious consequence of one of the main theories used to explain glitches. In this theory, glitches are caused by a momentary coupling of the neutron star’s outer crust, to the more rapidly rotating superfluid on the interior. This coupling should cause the outer crust (which we observe) to accelerate. The authors observed the anti-glitch in the pulsar 1E 2259+586 after nearly two years of weekly monitoring with the Swift X-ray Telescope. 1E 2259+586 is an example of an unusual class of pulsars known as magnetars. Magnetars possess exceptionally strong magnetic fields (~1014 Gauss), have longer rotational periods than standard pulsars (2 – 12 seconds), and exhibit occasional bursts of X-rays and Gamma-rays. While in normal radio pulsars the total amount of radiated energy is on par with the amount of rotational energy lost over time, the same is not true for magnetars. Their X-ray emission requires another power source, and it is believed that the strong magnetic field plays a role. In Figure 2 we show the results from this X-ray monitoring campaign. The spin frequency (i.e. rotation rate) as a function of time is displayed in the top panel. The drop in frequency around year 2012.3 (see the top axis label) is the anti-glitch. The middle panel shows the residuals when you subtract a single rotational frequency, decaying at a constant rate, from the data in the top panel. The bottom panel shows the X-ray flux over the same time period, demonstrating that the anti-glitch was accompanied by a strong X-ray flare. Figure 2. 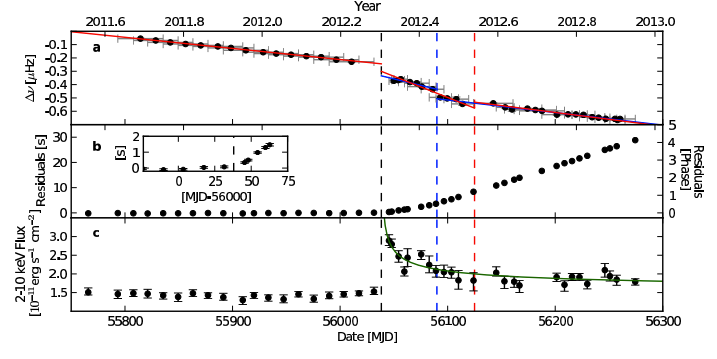 X-ray timing data and X-ray flux for magnetar 1E 2259+586. The anti-glitch is seen as a drop in rotation frequency in the top panel. See text for other details. So what caused this anti-glitch? In the context of the model described above (a coupling of the outer neutron star crust to the inner material), an anti-glitch would require the interior fluid to be rotating at a slower rate than the outer crust. This is not expected to be the case for the entire interior; however, it is possible that there are pockets of more slowly rotating material. Alternatively, an external process could have caused the anti-glitch. The authors use the Very Large Array radio telescope to look for evidence of particle outflows from the pulsar (which would carry away angular momentum, causing the rotation rate of the pulsar to slow). They found no evidence for such an outflow to a fairly deep limit. As this is establishing what we already know of glitches, did you mean to say increase rather than decrease? Thanks for your comment! I realize the wording is confusing, especially because I switched between talking about rotation period and rotation frequency in the article. A decrease in rotation period would imply an increase in rotation frequency (i.e. rotating faster) so I think the current wording is correct.